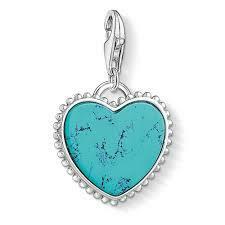 From Thomas Sabo Charm Club is this Turquoise Heart Charm. A stunning addition to any Thomas Sabo charm bracelet. This charms adds a personal touch to a gift for her. This Thomas Sabo Turquoise Heart Charm features a heart design with small silver dots lining the edge of the symbol. Inside of the charm it is embellished with a high quality Turquoise stone which adds a stunning touch to the charm. This charm would make a great gift.